Photo of a breaching Killer Whale. Wildlife Photos are not always easy to capture. It takes time, patience, knowledge and respect of the animals to get some very good Wildlife Photos. See my Portfolio on Killer Whales. This Pictures was taken of Northern Vancouver Island, in the region of Johnstone Strait and Queen Charlotte Strait. Johnstone Strait is a very popular site for kayaking with killer whales. Make sure to read our story about British Columbia Whale Watching. 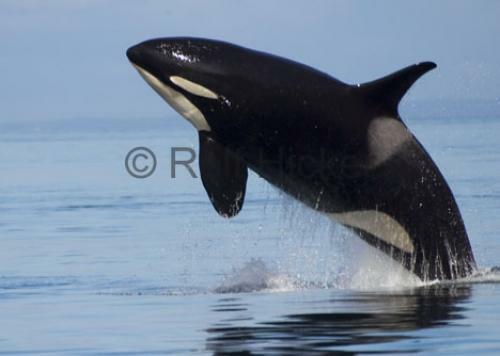 Pictures from photo gallery "Killer Whale Pictures"
This picture is part of the photo album "Killer Whale Pictures" - there are more beautiful images waiting for you.